Updated 150325: I’m still a huge fan of the Dorkfood DSV for its bullet-proof design and scalability. But I couldn’t resist backing the Anova Precision Cooker on kickstarter. You can read my review of it here. I’m the first to admit I’m no cook. But nobody who’s shared a meal with me can deny I love to eat. Besides the love of good food, there are few things I enjoy more than sharing a great meal with people I love. Mix cooking with the Geekery that runs deep in my being and you gotta know I’ve been experimenting in the kitchen 🙂 For better or worse, it’s been an adventure and I’m sure glad Quin and the Boyz are infinitely patient with my mis-haps and (mostly) edible adventures. Throughout the ups and downs, sous-vide cooking has become one of my favourite techniques. This posts goes over the why’s, what’s and the best tools to get you started. Doesn’t sound like anything interesting going on here, so what’s so special about sous-vide? If you’ve ever eaten an overcooked piece of chicken/pork/beef/fillintheblank you know the pain and suffering there is in wasting good money (and calories) to ill-prepared food. Imagine never overcooking your steak again. Or making chicken breast so succulent you can cut it with a spoon. That’s the magic of cooking sous-vide. The secret is in the water bath: a sous-vide machine maintains the water bath at the exact final temperature you want your food cooked to. Unlike cooking with a stovetop/oven/grill/steamer there’s no chance of over-shooting your finished temp, so it’s near impossible to overcook your food! Because your food is vacuum sealed and held at low temperatures, its flavours are intensified and textures can be transformed from rough and chewy to tenderloin tender. Imagine buying a cheap piece of chuck roast (usually one of the cheapest cuts of beef you can find) and transforming it into filet mignon-like goodness. A piano refinisher once said to me, ” You can’t make rosewood out of a 2×4.” In the world of food, sous-vide seems to prove otherwise. Once you find your favourite target temperatures for your foods of choice, perfect results are easily repeatable and preparing food better than 90% of restaurants becomes a reality. If you’re cooking for a lot of guests sous-vide is a great way to make sure the food is ready when your guests are. No more stressing about latecomers ruining your perfect meal – an extra hour in the water bath will do no harm so food will be piping hot and perfect when you’re ready to sear and serve. After putting your food in the water bath you can walk away without worry until your timer goes off. You’re not a slave to the stovetop or oven and you can spend time doing other things like making an awesome cup of coffee or getting in a quick 5-minute workout. Or both. There’s nothing particularly hard about sous-vide cooking but the cooking times are typically longer than with high-heat cooking. But Low & Slow cooking, whether in a water bath or your smoker, has its rewards. So long as fast-food isn’t your mandate, superior flavour development, texture and creating dishes you simply can’t otherwise makes the extra time worthwhile. Quin loves a streamlined kitchen so it was a tough-sell to allot funds and counter space to yet another kitchen gadget. Instead of buying the gear at the get-go, I experimented using Kenji’s excellent Beer Cooler Sous-vide Hack over at Serious Eat’s. He’s a smart dude and by following his instruction and using stuff we already owned I was cooking steak and chicken sous-vide like nobody’s business. After a month of testing and some relative success, it was easy to justify the purchase. Asian Rice-Points Bonus: the sous-vide machine we recommend below is relatively inexpensive (as far as kitchen electronics go), versatile, and can easily grow with your needs. Another Bonus: For the penny-wise, the money spent on the gear required to sous-vide can be quickly recouped by turning cheap cuts of meat into party favourites. Don’t believe me? Compare your local butcher’s price of chuck roast with typically more “tender” cuts and you can save well over 50% on your meat AND create a better finished roast. Several roasts later and you’ll have recouped your costs. Triple Bonus: with the recommended FoodSaver vacuum sealer you can take advantage of sales at your favourite butcher, saving even more money. Vacuum sealing deprives food of oxygen which helps prevent dreaded freezer burn. You can also choose to sous-vide a whole bunch of chicken breast and quick-chill the extra. It’ll keep for weeks in the fridge or years in the freezer and only requires a quick re-heat to final temp when you’re ready to feast. Any lover of grilled food will know and love the Maillard reaction which is the complex chemical reaction responsible for the amazing crust you get on grilled food and browning of pastries. Unfortunately, the Maillard reaction required temperatures well beyond the boiling point of water. Easy fix: for foods on which you want a crust, sear your food after sous-vide and you’ve got the best of both worlds: crispy and tasty on the outside, and tender and juicy on the inside. Not to be overlooked is the fact, with few exceptions (eggs? ), we’re cooking our food in plastic, sometimes for days. Nom Nom Paleo’s post on the health issues surrounding cooking in plastic is a great read on the subject and a major reason we went on a plastic-purge. But a funny thing happens when you try to live plastic-free: you realize almost all the food we buy (even the organic stuff) is packaged in – you guessed it – plastic. You’ll have to make your own decision but as for us, we’re comfortable cooking sous-vide in official FoodSaver bags and choose not to sous-vide foods which require high(ish) temperatures (read: vegetables). With food prep of any kind, food poisoning is definitely something you need to be careful of. Anyone who’s ever had the good fortune of getting food poisoning (has anyone NOT had it?) can understand why I spent a LOT of time researching this subject. Unfortunately much of the online information on sous-vide and food safety is either too simplistic or overly complicated. Definitely the best free resource on the subject is Douglas Baldwin’s online guide to sous-vide cooking. But even after looking up Douglas’ various List of Tables, I was confused as to how long I really needed to sous-vide my meat. One big “Ah-ha!” moment for me was understanding that some food doesn’t have to be pasteurized to be safely consumed – sushi and steak tartar and regularly eaten without issue. Pasteurization, however, is still a good idea when cooking chicken, for those who are pregnant, have auto-immune deficiencies, or when you want to quick-chill after cooking and save the food in the fridge/freezer for later consumption. Besides, if you have a choice, it’s better safe than sorry when it comes to your health. Time from fridge or freezer to final target temp + Pasteurization time at final temp = Total sous-vide cook time. The real problem that comes with cooking sous-vide – it’s hard to justify going out to eat when you can prepare food so well at home. The good news: there are more choices than ever for home cooks who wants to venture into sous-vide cooking. Instead of buying used lab equipment, a search on Kickstarter shows several models at various price points. I, however, am impatient. And after investing in 3 kickstarter projects and still waiting for the last one to ship, I’ve begun to understand the “expected” date of delivery for kickstarter projects can be a little “optimistic” to be sure. Thankfully there’s already great sous-vide tools available for Geeks like me which are less expensive, reliable and more versatile than many. Below is a video and write-up of the setup I’ve been using with great results. The DorkFood DSV won’t win any style-awards, but it’s the sous-vide controller I invested in after much research and thought. You’ll need to mate the DorkFood DSV with a suitable heat source like an inexpensive non-digital Crock Pot or rice cooker. But therein lies a huge benefit: Unlike competitors, the lack of a heat source means you can choose to cook a little (like a in a small crock pot) or a LOT (like in a HUGE beer cooler) – all you need to do is switch to a more powerful heat source and larger vessel and you can cook for an entire football team. Check out Dorkfood’s website here for more details. For our family of four, a generous-sized (and inexpensive!) 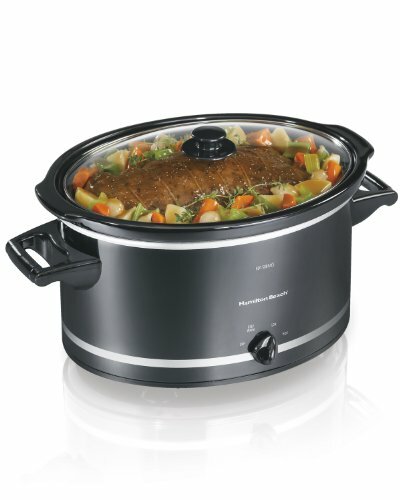 Crock Pot is a good every-day all-in-one sous-vide heat source + vessel. Simply plug this into the business-end of the Dorkfood DSV and you’re ready to add your bagged meat and water to create some amazing sous-vide meals. For large parties, I need to go big. Thankfully, the Dorkfood DSV can accommodate – pick up this 500-Watt Titanium Heating Tube and throw it, your meat and water into this huge Beer Cooler and you’re ready to cook for the entire neighbourhood! 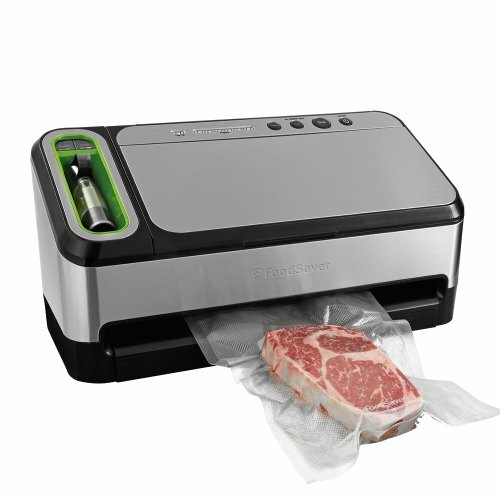 Once you out-grow using the Ziplock freezer bag hack, the best step-up for cooking sous-vide is a FoodSaver vacuum bagging system. Besides being great for sous-vide, we’ve found it surprisingly useful for saving money by vacuum-bagging a variety of frozen goods ranging from raw meat to pre-shredded cheese. For foods you’d like to add some crust (i.e. pretty much every meat with the exception of skinless chicken breast and fish), the Iwatani Torch is hard to beat. I’ve used other butane torches but the Iwatani takes inexpensive butane canisters and creates a hotter flame without having to go propane or learn how to weld. I also lets me sleep easier at night since the torch can be easily removed from the butane canister, preventing potential leaks and allowing storage of the butane canisters in the garage. You can always kick it up a notch and go all-out and finish your food on a super-fired-up weber chimney, but I digress, and this post has gone on long enough. Now that we’ve got the tools out of the way, the best news is that sous-vide recipes are typically super-simple. I’ve experimented with pretty much every meat I can get my hands on, but have had the best results so far with chicken and beef. The only thing I’ve really “ruined” is over-cooking skinless/boneless chicken breast. Moral of the story: don’t sous-vide chicken breast for more than 4 hours or the texture degrades from juicy succulence to mushy ducky.